The name of Cicely Saunders is synonymous with one of the major social innovations of the twentieth century: the modern hospice movement. Saunders was born in England on June 22, 1918, the first of three children of Gordon and Chrissie Saunders. She enjoyed the material comforts of a successful middle-class family, and at the age of fourteen was sent to Roedean, one of the country's exclusive boarding schools for girls. In 1938 she went to Oxford University to read politics, philosophy, and economics, but interrupted her studies two years later to become a student nurse at the Nightingale Training School of London's St. Thomas's Hospital. When a back injury forced her to leave nursing, she returned to Oxford and qualified in 1944 with a diploma in public and social administration. She then commenced training as a hospital almoner, or medical social worker. In a large London hospital Saunders became involved in the care of a patient who was ill and dying far away from his own home. His name was David Tasma, and he had come to London as a refugee from Poland's Warsaw ghetto. In the short time that they knew each other, he proved an inspiration to Saunders, and their professional relationship turned into a deep friendship. One day he said to her, "I want only what is in your mind and in your heart." This combination of emotion and intellect proved to be a guiding theme in her subsequent work. The two discussed an idea that it might be possible to create more homelike places where people could end their lives. When Tasma died, on February 25, 1948, he left Saunders with a gift of £500 and the following encouragement: "Let me be a window in your home." Saunders determined immediately to learn more about the care of the terminally ill. First she worked as a volunteer in St. Luke's, a home for the dying in Bayswater, London. Then she made the momentous decision to study medicine, starting in 1952 and qualifying at the age of thirty-eight. She began to see her work with dying people as a form of religious calling or vocation. In 1958 she took up a position as Research Fellow at St. Mary's School of Medicine, conducting work at St Joseph's Hospice in Hackney, in the East End of London. Here she laid down the basic principles of modern hospice care. She developed a systematic approach to pain control in terminally ill patients; she gave attention to their social, emotional, and spiritual needs; and she began teaching what she knew to other people. Her concept of "total pain" provided a revolutionary way of conceptualizing the complexity of patients' suffering. In response to medicine's despairing rejection of the dying patient—"There is nothing more we can do"—she offered a positive, imaginative alternative that sought to ensure pain relief, maintain dignity, and enhance the remaining period of available life, however short. Soon Saunders made plans to build her own modern hospice. To signify that it would care for people on their last journey in life, it was given the name St. Christopher's, referring to the patron saint of travelers. She gathered a group of supporters who helped to work out the plan in detail, and she traveled to the United States and other countries to promote and refine her ideas. There were huge barriers to be overcome, including the low priority assigned to the care of the dying in the British National Health Service, a lack of research, no specialized education in the field, and social indifference to matters of care at the end of life. Yet, after eight years of fund-raising, planning, and promoting the idea, Saunders saw St. Christopher's Hospice open to its first patients in 1967. As she often remarked afterwards, "It took me nineteen years to build the home round the window." Along the way she had marshaled help from major charitable donors, from senior figures in the establishment, and from a growing body of clinicians and lay people committed to the development of this work. Cicely Saunders's approaches to pain relief and tending to the emotional and spiritual needs of terminally ill patients helped shape the modern hospice movement. For the next eighteen years Saunders was the medical director of the hospice she had created. She quickly expanded its services to include home care; she promoted research into pain control and into the efficacy of the program; and she developed a center for specialist education. During this time she authored some eighty-five publications, some of which appeared in several languages. Constant media attention made the hospice well known throughout the world. Her work was acclaimed internationally, and she received many prizes and honors from numerous countries, including the Lambeth Doctorate of Medicine (1977); the Gold Medal in Therapeutics of the Worshipful Society of Apothecaries, London (1979); the Templeton Prize for outstanding contributions in the field of religion (1981); and entry into the Order of Merit, the highest honor within the British system (1989). St. Christopher's received thousands of visitors each year and became a beacon of inspiration for others who came to study, develop clinical skills, and conduct research. In 1985 Saunders retired from full-time work at the hospice but remained active in her writing, teaching, and support for developments in hospice and palliative care. Both her private and professional life continued to be matters of public interest. She became the subject of a biography and of television documentaries and press interviews. In 1980 she married the Polish artist Marian Bohusz-Sysko, whom she had first met in 1963. She continued to travel and give lectures and presentations, especially after her husband died in 1995; her work remained a source of inspiration to those endeavoring to develop palliative care around the world. Her eightieth birthday was celebrated in 1998 with a conference in her honor at the Royal College of Physicians, London. In 2000 she retired from the position of chairman at St. Christopher's Hospice to take on the role of president/founder and to assist in the development of a new palliative care institute that will bear her name. Clark, David. "'Total pain,' Disciplinary Power and the Body in the Work of Cicely Saunders, 1958–67." Social Science and Medicine 49, no. 6 (1999):727–736. Clark, David. "Originating a Movement: Cicely Saunders and the Development of St. Christopher's Hospice, 1957–67." Mortality 3, no. 1 (1998):43–63. Du Boulay, Shirley. 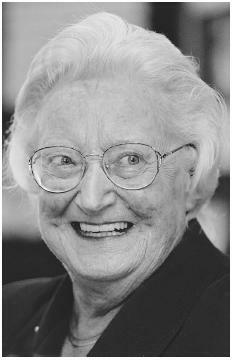 Cicely Saunders: The Founder of the Modern Hospice Movement. London: Hodder and Stoughton, 1984.
i think that cicely saunders is very fasinating and that she is very inpressing i would have loved to meat her and talk to her she is so kind and helpfuland many people loved her. she has done so much for this world.